Title text: The <x> that is held by <y> is also a <y><x>, so if you go to a food truck, the stuff you buy is truck food. A phone that's in your car is a carphone, and a car equipped with a phone is a phonecar. When you play a mobile racing game, you're in your phonecar using your carphone to drive a different phonecar. I'm still not sure about bananaphones. Most English compound nouns can be constructed recursively. In many cases they are written open or spaced like "piano player" (a player of a piano.) But closed forms like "wallpaper" (paper for a wall) are not less common. Randall is engaging in creative linguistics again. This time he is humorously suggesting to use a consistent naming scheme for things holding other things, the same way we call a boat holding a house a houseboat. He is extending this to all combinations boats, houses and cars. This would, however, be somewhat impractical, as these names do not include why one thing is on an other, and are also sometimes ambiguous: a carcar can be a tow truck as much as a car carrier, and a househouse can be either an apartment (house in a house) or an apartment building (house containing houses). In the title text: "Truck food" is in some areas a common term for the meals offered by "food trucks". Car phones were a feature in automobiles throughout the late 1960s, 1970s and 1980s, serving as the predecessors to mobile phones, although they were permanently installed into a car and not removable. Bananaphone, a song by Raffi Cavoukian, is also mentioned. 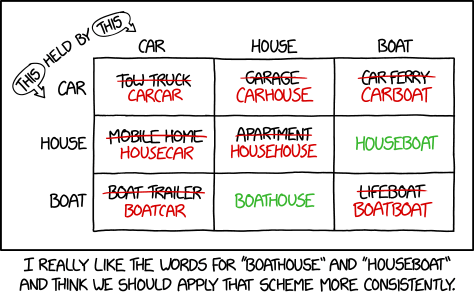 I really like the words for "boathouse" and "houseboat" and think we should apply that scheme more consistently. The first version of the comic image used a different wording to indicate which word held the other. The column word holds the row. The original wording can be seen here. A “house car” is a motor vehicle originally designed, or permanently altered, and equipped for human habitation, or to which a camper has been permanently attached. A motor vehicle to which a camper has been temporarily attached is not a house car except that, for the purposes of Division 11 (commencing with Section 21000) and Division 12 (commencing with Section 24000), a motor vehicle equipped with a camper having an axle that is designed to support a portion of the weight of the camper unit shall be considered a three-axle house car regardless of the method of attachment or manner of registration. A house car shall not be deemed to be a motortruck. Shouldn't a boat that holds another boat be some sort of either carrier, or at-sea repair dock? Sort of like a mothership, or a drydock? Or an oil rig (technically considered a ship by international law), etc? This page was last edited on 9 November 2018, at 21:36.